Tata Trusts is amongst India's oldest, non-sectarian philanthropic organizations. Tata Trusts has played a pioneering role in transforming traditional ideas of charity and introducing the concept of philanthropy to make a real difference to communities. Through grant-making, direct implementation and co-partnership strategies, the Trusts supports and drives innovation in the areas of natural resources management, education, healthcare & nutrition, rural livelihoods, enhancing civil society and governance, media, arts, crafts & culture, and diversified employment. The Trusts engages with competent individuals and government bodies, international agencies and like-minded private sector organizations to nurture a self-sustaining eco-system that collectively works across all these areas. How the Idea of micro planning initiative came into reality. 2014 to make Indian villages into smart villages. This scheme proposes that during the tenure of the present Parliament, each of the 795 MPs will choose and work towards making 2 villages in their constituency as "Adarsh Gram" (ideal village). The scheme envisages that the MP will provide leadership to converge all central and state Government schemes for the purpose of ushering in the developments in the Adarsh Gram. The Trusts received responses from various MPs; including Hon’ble MP of Vijayawada-Mr. Kesineni Srinivas and Hon’ble MP of Bengaluru (Rural)-Mr. Veerappa Moily. 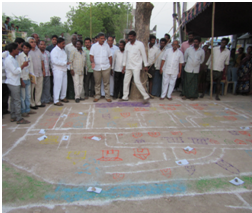 To begin with, the Trusts conducted a detailed micro-planning activity in Dec-2014 in Gollamandala - the village adopted by Mr. Kesineni Srinivas under the SAGY. The MP was impressed with the quality of the mobilization and the micro-planning exercise. He requested that he would like the Trusts to help him repeat the exercise for the remaining 264 Gram Panchayats (GPs) in his constituency as well. He went personally to meet the Managing Trustee as well as the Chairman to communicate his desire to collaborate with the Trusts at a larger scale. This presented a challenge as well as an opportunity for Trusts to scale this kind of operation. The Trusts began its activities in Vijayawada, Andhra Pradesh, by initiating an assessment of the needs of each village at household level. The Trusts took up this opportunity to design a program called as Micro-Planning Assessment (MPA). With the help of a technical partner, Social Cops, and an implementing partner, Centre for Peoples Forestry (CPF), a comprehensive survey was conducted in the rest of the 264 GPs of Vijayawada Parliamentary Constituency (VPC). This MPA was done digitally with the support of more than 1000 local volunteers who were trained on how to use tablets and smart devices. The task involved gathering detailed data from over 2.5 lakh households in these 264 villages. The MPA was conducted over a period of three months resulting in the development of VDPs for each of the 264 GPs. After the preparation of Village DevelopmentPlans through micro planning initiative,they were then presented to executives and decision makers at various levels including the CM’s office, the planning department and district administration. The Trusts also came forward to facilitate the development of these villages with the help of various state departments. For that an MoU was signed on 24th August, 2015, between the Government of Andhra Pradesh and Tata Trusts to develop 265 GPs as ‘Adarsh Grams’.